Plans are taking shape for a new meeting and exhibition venue dedicated to the topic of climate change, to be built on the coast in Lemvig, western Denmark. 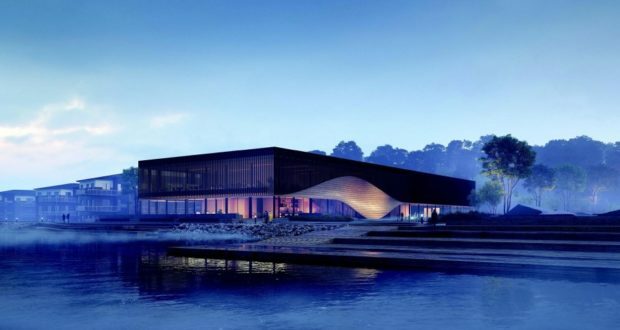 Copenhagen-based architects 3XN, working in collaboration with Orbicon and SLA, have won a competition for the design of the new €6.87 million building, to be called the Climatorium. Built to protect the asset of salt water, it “seeks to form a modern interpretation of the area’s nature and fishing culture, while also influenced by local climate conditions”, in the words of the Daily Scandinavian. Lemvig Climatorium is part of the Coast to Coast Climate Challenge (C2C CC), a six-year project that runs until the end of 2022 that aims to protect assets from the negative consequences of climate changes. It will collect knowledge about salt water that is relevant to trade and industry, tourism and the local population. Architecturally, the timber entrance has the form of a wave, referencing a ship’s hull and the Nordic fjords, the architects say. The two-floor building will be energy-neutral and have public spaces to host exhibitions about climate change, conferences, concerts and events, as well as a permanent café and offices. It will have a glass façade that opens onto Lemvig Harbour, making the timber upper floor look as if is floating in the air. Around it, a landscape called the Climate Wedge will have soft curves that represent meteorological isobar lines that show the typical weather of the area. The local utility company behind the project, Lemvig Vand og Spildevand A/S, is studying the possibilities for tourism and the potential for working with other tourist attractions in the region.